A 6.2 Magnitude Earthquake Strikes Paradise! | Chaos Sweeps Away the World We Know! The Disaster, current events & Catastrophe Blog. Forecasts for 2014 to 2022. Read tomorrows news today! Plus current economic, commodities, stock indices and financial news. ← Super Typhoon Muifa Set to Wreak Havoc in Asia. 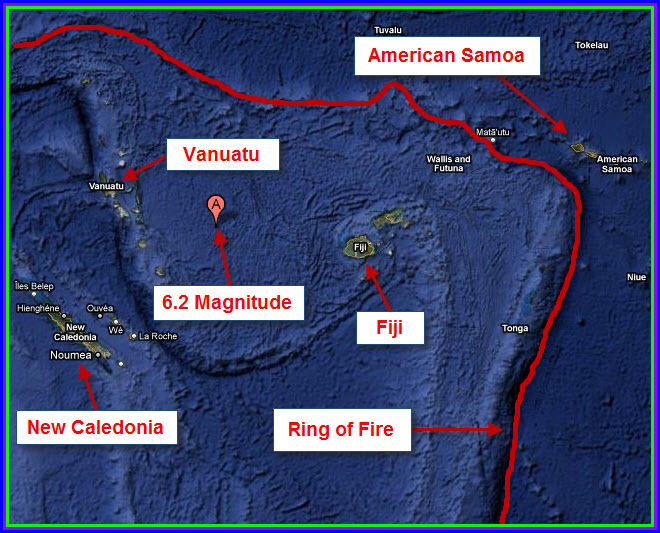 July 31, 2011 – – A 6.2 Magnitude Earthquake Struck the South Pacific Paradise: At 7:35AM PDT (Pacific Daylight Time) July 31st, a 6.2 magnitude earthquake struck near the South Pacific Island paradise of Vanuatu. Fiji, American Samoa and New Caledonia are also in the region (see map above). The 6.2M tremor was 1,381 miles north of Auckland, New Zealand. There were no tsunami warnings in effect. The south pacific Island nation of Vanuatu was 250 miles west of the quake site. The quake was 14 miles deep, which is a shallow earthquake and may cause damage if it strikes close to a populated area. This was the case in the Christchurch, New Zealand quake. There are approximately 134 earthquakes, of between 6.0M and 6.9M; that strike somewhere on the Earth yearly, according to the USGS (United States Geological Survey). Today’s shaking struck on August 1st at the epicenter, since it was west of the International Date Line (relative to the United States). The quake occurred at 4:35AM on July 31st in New York City, 5:35Am in Chicago, 6:35AM in Denver and 7:35AM in Los Angeles. This entry was posted in Events, Misc, Miscellaneous, Nature, New Zealand, News, United States and tagged 6.2 earthquake, 6.2 magnitude earthquake, american samoa, auckland, auckland new zealand, chicago, chrischurch new zealand, christchurch, denver, fiji, july 31 2011, july 31 2011 earthquake, Los Angeles, New York, new york city, new zealand, south pacific, south pacific earthquake, United States, usgs, vanuatu. Bookmark the permalink.